The Great American Eclipse: What’s in a Name? Juliet tells Romeo that nothing’s in a name. “That which we call a rose, by any other name, would smell as sweet,” she says. And even Hamlet seems dismissive in his “words, words, words.” But after the Great American Eclipse, I must rebuff the beautiful maiden and challenge the churlish prince. Au contraire sweet Juliet. And as for Hamlet, well, a noble mind o’erthrown, and so forth. Monday afternoon, August 21st, my friend George and I watched the moon creep through those final degrees toward totality. The two of us and our wives were on a quest. Thousands of people rested in lawn chairs or lay on blankets before the capitol building in Jefferson City, MO. On the stage, set up on the capitol steps, the Fort Leonard Wood military orchestra performed. Kids tossed footballs, played in the fountains, chased each other through the obstacle course of resting adults. Clouds drifted lazily by, bringing with them some unease about missing the Great American Eclipse. But when the final seconds ticked into totality, all eyes stared at the clear blue sky, and a roar went up from the multitude. Then just as quickly, the roar died into silence. Awestruck, we listened to the cicadas wailing in the mid-day dark. 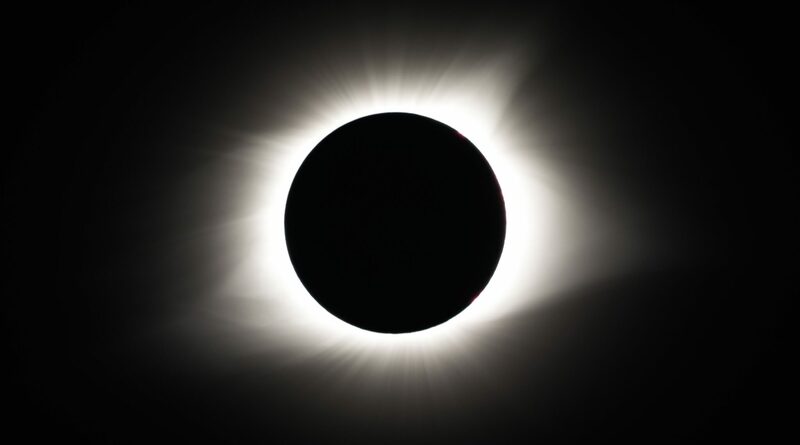 The bright corona flared around the black ball of the sun. It was an eclipse, but suddenly that word, which had been mundane, even common, was charged with mystery and awe. It had put on a stunning new mantle. A few minutes later George asked, “What word would describe the eclipse? What word would best communicate something beyond the ordinary, beyond the natural?” We rejected the word “supernatural” immediately as far too tired and burdened with the clutter of history. A dictionary reveals the problem: Supernatural: of or relating to an order of existence beyond the visible observable universe; especially, of or relating to God or a god, demigod, spirit, or devil; departing from what is usual or normal especially so as to appear to transcend the laws of nature: attributed to an invisible agent (such as a ghost or spirit). Nope, just doesn’t fit. What we had seen was governed entirely by the laws of nature. The term preternatural offered itself, and we thought perhaps it would work. Preternatural: beyond what is normal or natural, extraordinary, exceptional, uncommon, singular, unprecedented, remarkable, phenomenal, abnormal, inexplicable, unaccountable; strange, mysterious, fantastic. That was more like it. All these words accurately apply to the eclipse. In fact, when taken together, they are, as a whole, a good summary of an abstract description of what happened in the sky above us. But our experience was not abstract in the least. Preternatural would not do. Each of us had experienced the eclipse as something spiritual (not supernatural), something natural that seemed to stop time, to pull us out of ourselves. And the response of thousands of people gathered there revealed that the immediate, shared human response was not just awe, but joy. A shout, clapping, and laughter erupted. We were all drawn totally into the moment, and in that moment there were no democrats or republicans, no liberals or conservatives, no northerners or southerners, no believers or atheists. There were only human beings sharing an experience of totality, an experience of total self-forgetting, of good will and unity. It must have been what the ancient Israelites felt when they saw God in a whirlwind or pillar of fire. And so begins the journey from nothing to something. The novel projects the irony of the detective searching for himself. All those he meets know him, but he knows none of them. His memory begins to return in bits and pieces, brief snatches of the past. And he discovers at the heart of his search for himself a dark secret, gradually revealed. His role in the disappearance of someone very close to him. Patrick Modiano won the 2014 Nobel Prize for Literature. Missing Person is an early novel (1978), but it embodies the themes for which Modiano has become known—the power of the past and the search for identity. The prose in this short novel (under 200 pages), while exploring these themes, exhibits his beautifully crafted style and his haunting, melancholy tone. I loved reading this novel, like slowly eating a perfect lasagna, or ravioli, with a glass of good Cabernet. You chew each bite slowly and savor it. I would have liked to give Missing Person an unqualified 5-Star rating, but when I got down to that last bite, I found it beautiful but unsatisfying. The tone of the short final chapter is exquisite, and the final two sentences are stunning. But alas the resolution of the story was left open-ended, and I confess I felt betrayed. I highly recommend this novel to anyone who loves finely crafted style in literature and the deep exploration of human identity. Those looking for high action will be disappointed.